The beginning of a new academic year! I had a great time catching up with colleagues and presenting new results from my current research in Sacramento at the annual Ecological Society of America meeting! Excited for the start of the academic year! This fall I am teaching with Drs. 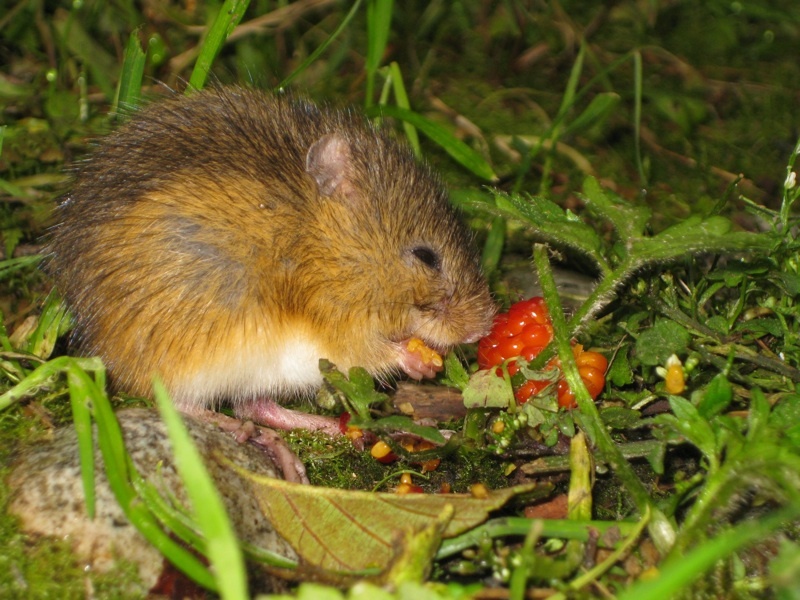 Marschall and Miriti in Quantitative Population Ecology. I am currently teaching Tropical Ecology through the Evolution, Ecology and Organismal Biology Department at The Ohio State University. Check out the course website, where students have been reflecting on their experiences, sharing concepts learned that day, and discussing their research projects. What happens to the spatial pattern of plants when humans extirpate the animals that disperse their seeds? I will compare results from an individual-based model and analytical approximations (see the abstract and watch the live stream online!). I will be presenting results of an individual-based model at the University of Utah (see the abstract). Led by Dr. Stephenson, we show that the rate of carbon accumulation for individual trees doesn't slow down but increases with tree size. 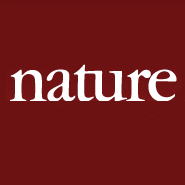 Read the full article "Rate of tree carbon accumulation increases continuously with tree size" recently published in Nature. Check out the summary and podcast with Nathan Stephenson. Check out the last workshop in the Ecosystem Dynamics and Management Program this fall. I am represening MBI at the Seventh Annual Mathematical Field of Dreams Conference organized by the National Alliance for Doctoral Studies in the Mathematical Sciences and am excited to learn more about the Alliance and meet some of its scholars! Drs. Dybzinski, Tilman, and I show that the density of neighbors and relatedness among plants do not affect fungal attack or insect seed predation of developing seeds in "Neighborhoods have little effect on pre-dispersal fungal or insect seed predation in a grassland biodiversity experiment" recently published in Oecologia. Check out the second workshop in the Ecosystem Dynamics and Management Program this fall. Check out the schedule. Watch the talks live here. 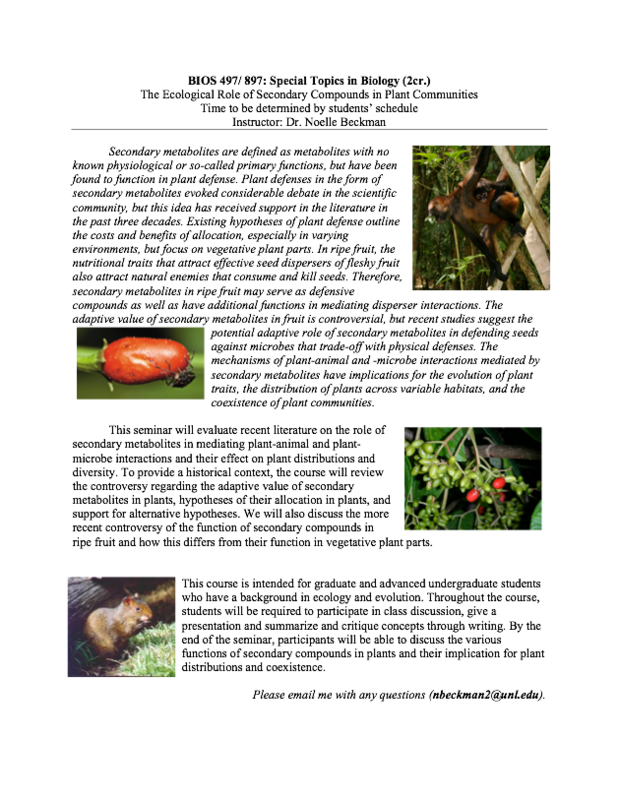 Check out my review paper in collaboration with Dr. Haldre Rogers on the "Consequences of seed dispersal for plant recruitment in tropical forests: interactions within the seedscape" in celebration of ATBC's 50th anniversary. This is the first workshop in the Ecosystem Dynamics and Management Program this fall. An annual workshop organized by the MBI postdocs to broaden the scientific perspectives and increase interactions among mathematical biologists early in their career. Check out the schedule and watch online. I will be returning to Minneapolis for the ESA conference! I am presenting work in collaboration with Dr. Fred Adler in the session, "What Is The Fate Of a Forest Without Vertebrate Frugivores? Merging Case Studies With Theory," organized by Haldre Rogers and Clare Aslan. Beckman, N.G. The distribution of fruit and seed toxicity during development for eleven Neotropical trees and vines. PloS ONE 8(7): e66764. Associated data can be found on Dryad. Check out the workshop on the mathematics of population demography at the end of June. Topics include applied research on the demography of tropical plants and mammals and theoretical research on demographic modeling. I am presenting work in collaboration with Dr. Fred Adler in the minisymposium, "From microscopic to course-grained modeling of social and biological dynamics", organized by MBI postdoc Arjun Beri and former MBI postdoc Harsh Jain. I will be presenting my research on the influence of vertebrates, insects, and pathogens on patterns of early plant recruitment in Central Panama in Arnoff Laboratory 104. See the flyer. 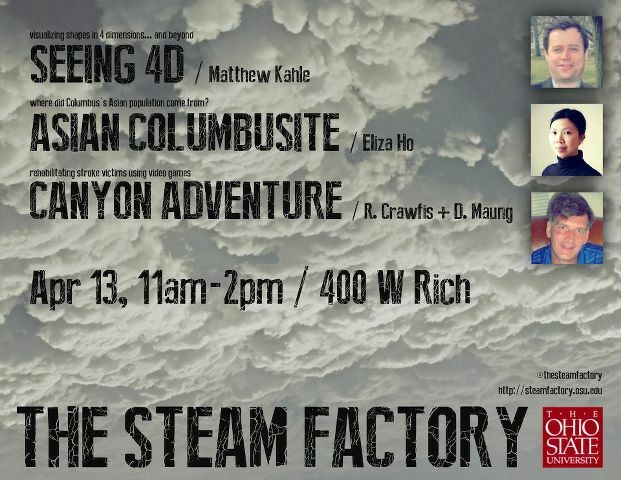 This week's STEAM Factory will showcase Seeing 4D; Asian Columbusite; and Canyon adventure. Find out more about the STEAM Factory and our events. I will be presenting my research on the influence of vertebrates, insects, and pathogens on patterns of early plant recruitment in Central Panama. See the flyer for more information and MBI website for live streaming. 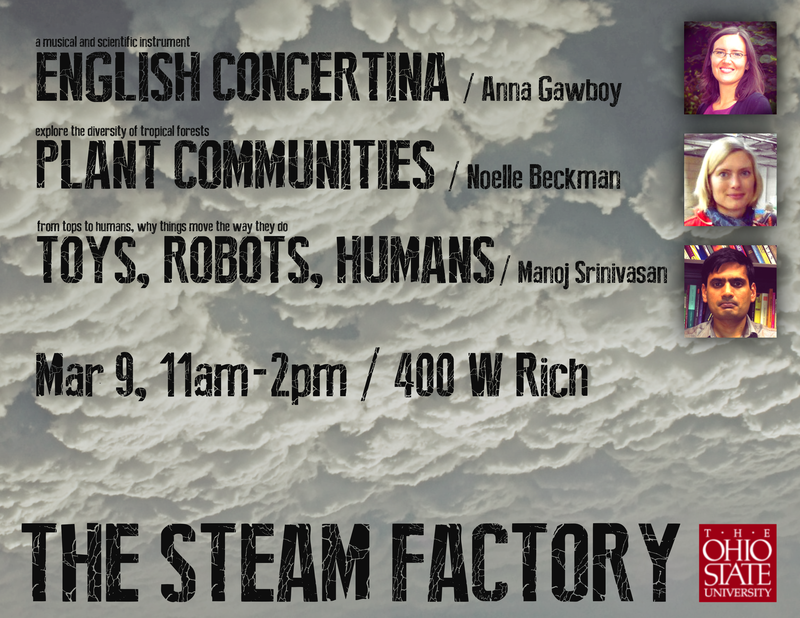 This week's STEAM Factory will showcase English Concertina; Toys, Robots, and Humans; and Tropical Plant Communities. I'll be showing photographs from my field work and discussing my research on tropical forest ecology. MBI seminar by Drs. Drew Purves ( Microsoft Research) and Mark Vanderwel (University of Florida.) Read an abstract and watch online. Find out more about Dr. Drew Purves' research and the statistical tools his group has been developing for ecological research. 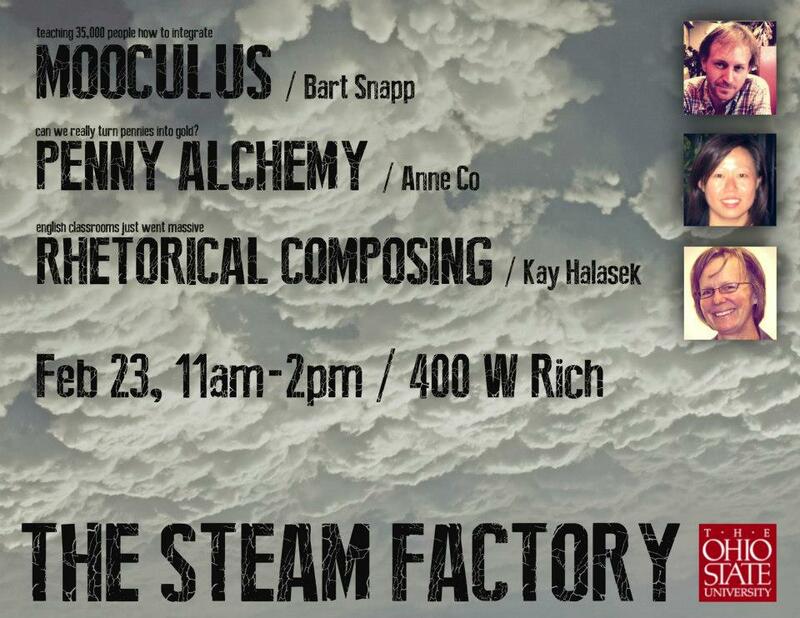 This week's STEAM Factory will showcase MOOCulus, Penny Alchemy and Rhetorical Composing. 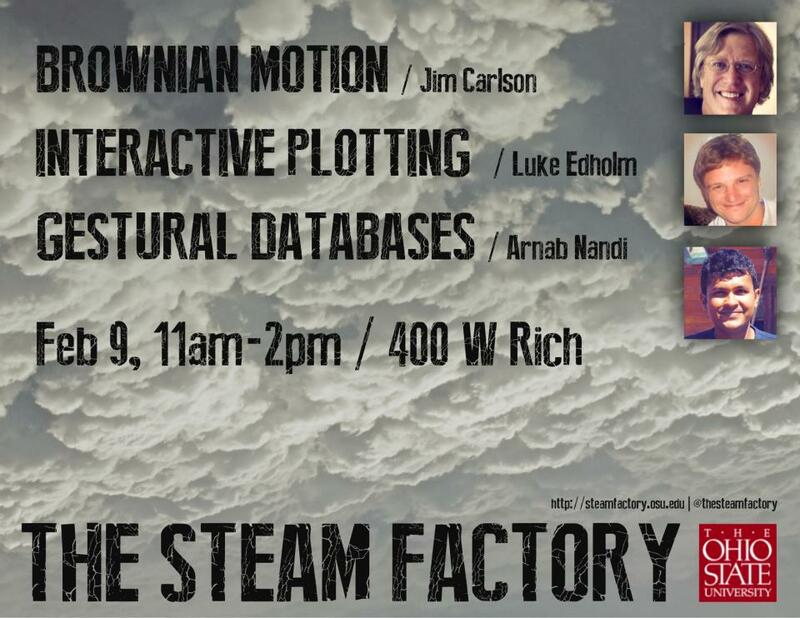 This week's STEAM Factory will showcase Brownian Motion, Interactive Plotting, and Gestural Databases. Stop by to learn more! This week's STEAM Factory will showcase MOOCS, Music Tagging, and Hyperbolic Plane Knitting. Stop by to learn more! Come to the Winter Market at 400 West Rich Street and support the first public appearance of the STEAM Factory, a place to learn more about what people at OSU are working on and establish interdisciplinary collaborations. This week is MBI's 10TH Anniversary Meeting, which includes lectures by Martin Nowak on the 'Evolution of Eusociality' and by Simon Levin on 'Challenges in Mathematical Ecology: Scaling and Collective Phenomena.' Check out the schedule and watch online. Postdocs are an integral part of a university’s research productivity. This past Monday the US House of Representatives passed US Resolution 1545 to recognize National Postdoc Appreciation Week, a success made possible by the National Postdoctoral Association. I am currently attending a workshop at MBI before I officially start my position. I presented a poster on my recent work on the influence of clumped seed dispersal and natural enemy attack on seedling spatial patterns, which I will be further developing as a postdoc at MBI. So far, I have met some great people and gained some insight into the types of models that are used within other sub-disciplines within biology. Check out the schedule and watch online. I officially accepted a Postdoctoral Fellowship at the Mathematical Biosciences Institute at Ohio State University. Hence I will be moving to Columbus, Ohio in August! At the Institute, I will continue to develop my quantitative skills and learn new methods in computation and mathematics that will take my research in new directions and enable me to answer broader questions in mathematical ecology. To start I plan to build upon a study that collaborators and I recently conducted that is in press in the Journal of Ecology. Stay tuned. Alon, Uri. 2010 How to build a motivated research group. Molecular Cell. 37:151-152. Alon discusses the importance of fostering autonomy, competence, and social-connectedness when building a motivated and productive research lab. Their discussion is based on findings by two psychologists that studied the conditions in which people are self-motivated. Alon suggests that successful research projects come out of an intersection of talents, passions, and objectives. 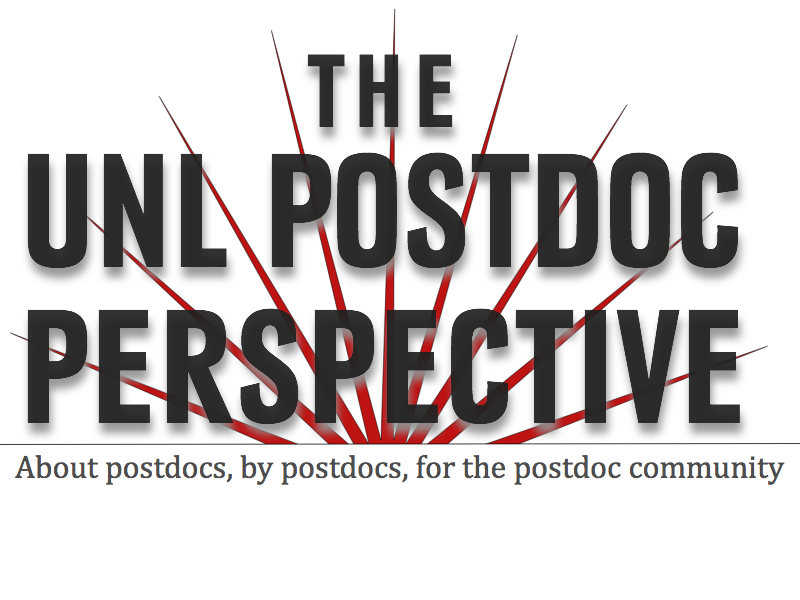 Check out the first issue of the UNL Postdoc Perspective. 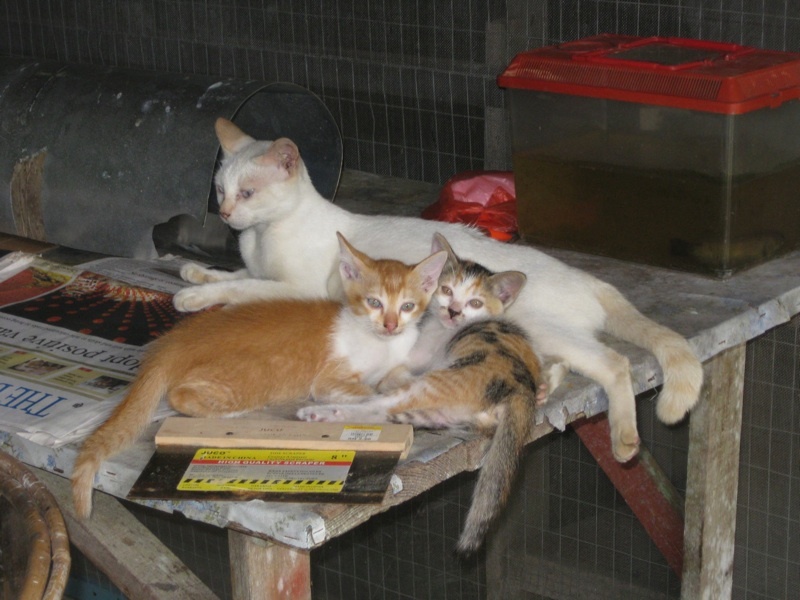 I added pictures from my field season in Malaysia this past spring (2011). Classes start Monday!I will be teaching a seminar on plant defenses this semester. Check out the flyer. I will be leaving January 6th for several months to Lambir Hills National Park. I will be setting up a year long experiment to determine the influence of soil type, leaf functional traits, and microbial communities on decomposition rates of leaf litter. I officially received my Ph.D. in Ecology, Evolution, and Behavior at the University of Minnesota July 30th, 2010 and moved to Lincoln, NE shortly thereafter to begin a Postdoctoral Fellowship with Sabrina Russo at the University of Nebraska, Lincoln. I have been here a couple of months settling into a new city and new field of research. During my position in Lincoln, I will shift my focus from studying the early stages of plant recruitment in Central Panama to studying factors that control leaf litter decomposition in Borneo. 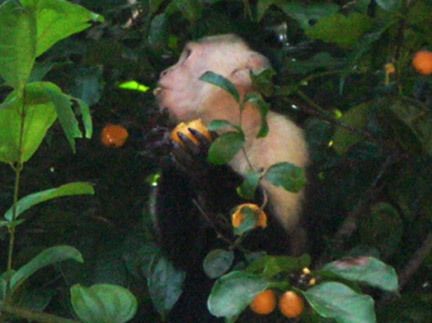 This month, I am finishing experiments in Panama that look at fruit toxicity in tropical plants. I am using sea monkeys and two foliar pathogens to assess toxicity in immature and mature fruit of 10 coexisting tropical canopy plants. To determine toxicity, I measure hyphal growth of fungus and the number of surviving shrimp in the presence of compounds extracted from fruit. The fungi are growing down lanes as can be seen in the image to the left, which Dr. Greg Murray uses in his work and thankfully allowed me to use as well. 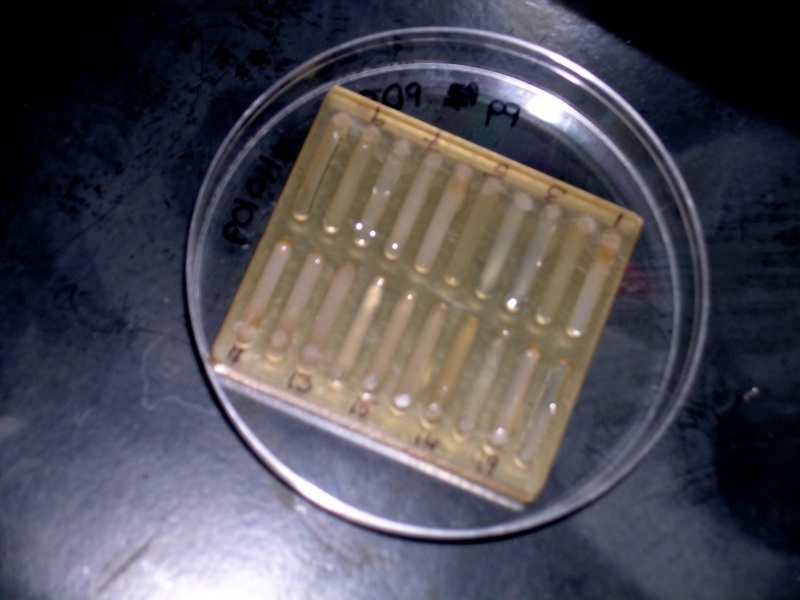 Measures of toxicity determined from these bioassays will then be combined with data of the survival of seeds in the canopy and in the presence of vertebrates, insects, and pathogens. With these data, I will be able to determine if seeds that are more toxic have higher survival. I have started visiting the cranes at Parque Natural Metropolitano (PNM) and Parque Nacional San Lorenzo (PNSL) in search of flowering plants. The parks are approximately 80 km away from each other, so I will be doing a lot of traveling. PNM is about 45 minutes and PNSL is about 3 hours from where I am living. Along the road to PNSL there is an unfortunate existence of construction along the main road which is the cause of unwelcome traffic delays. There are several trees and lianas flowering near the cranes which I have included in my photo albums. I am currently marking where in each tree will be my treatments of vertebrate exclosures, insecticide, and pesticide and counting flower buds and flowers.